If you are like me and obsessed with hydration in your skincare routine, then you will be always on the hunt for a hydrating lotion or toner. For me, hydration is a key pillar of my skincare routine and I always have a hydration lotion on hand. This is more so after I started using the moisture sandwich method. The Mamonde Rose Water Toner contains over 90% of rose water derived from damask roses. Its purpose is simple – to hydrate and sooth the skin. And that it does quite well. The texture of the water is very liquid, so I know there is great temptation at this point to reach for a cotton pad. Use it immediately after cleansing or after using an acid toner, and in between your skincare. Better yet, fill a spritz bottle with it, and use it as a facial mist! You can keep it in the fridge for a quick, cool spritz on hot afternoons. There are suggestions to use it with a paper sheet mask but I feel it’s just far too light for this purpose. You can however, use some cotton pads, saturate them, and just lay on skin for a quick mask. The Mamonde Flower Honey Toner is brand new, and it was the one that intrigued me the most. This is because this one is formulated with buckwheat flower, and is targeted at those with dry skin. That’s me! I bought this one after the event I attended, because I just had to find out if my skin would like it. Happily, it does 🙂 Unlike the Rose Water Toner, the texture of the Flower Honey Toner is a little more viscous. Just a little. It is still liquid, just has a little more slip to it, which is easily attributable to the higher glycerin content. As to whether it hydrates dry skin better, the answer is yes. I like using this immediately after cleansing, or after using an acid toner. Just drop 1-2 drops in your palm, spread it out, then apply to skin. It makes skin feel more supple, and with prolonged use, does seem to help skin stay hydrated longer. It must be due to the viscosity. However, if I were to layer, then this does not layer as well, perhaps because it is thicker. So for the moisture sandwich method, I’d use the Rose Water in between steps, but use this Flower Honey Toner at my first hydrating lotion. You can’t decant this one into a spray bottle due to the texture. There is one thing I’m not happy about, and that is the inclusion of alcohol in this product. While I personally have nothing against alcohol in skincare, I do wonder about its presence in a product that is meant to hydrate the skin. Alcohol is known to dehydrate, and considering that it’s close to the top of the INCI list, I wish they’d have avoided using it. This one’s interesting, because it’s targeted at those with oily skin. I naturally did not quite benefit so much. But why I say it’s interesting, is because it contains Eoseongcho flower and mud, to help absorb excess sebum in your pores. That accounts for the slightly muddy looking packaging and cloudy liquid. Before using, you must shake it up well first. This is to ensure that the mud that has settled is mixed up and distributed properly throughout the bottle. Then, pour some onto a cotton pad and wipe it over your skin. I don’t have this one, so I did not try it out. But I tested this at the media event and this is effectively a peel toner, with AHA, plum blossom extract and apricot enzymes. It is however, quite mild, so if you are in the market for a very mild AHA-based peel toner that helps exfoliate your skin cells, then you could consider this one. I know I am very much into acid toners (a little less enthusiastic these days) but I decided to pass on this, because I do already have ones that I am very happy with. I cannot vouch for this one however, so again, if you have tried it and want to share your thoughts, please do! This is the one that convinces me that Mamonde can make fragrance-free toners and should have! Because this Chamomile Pure Toner is targeted at those with sensitive skin, it contains no fragrance, and is soothing to the skin. It also contains only 6 ingredients, again good for sensitive skin because the fewer ingredients there are, the less chances of irritate – water, glycerol, propanediol, 1,2-Hexanediol, Dexpanthenol and Anthemis Nobilis (Chamomile) Flower extract. 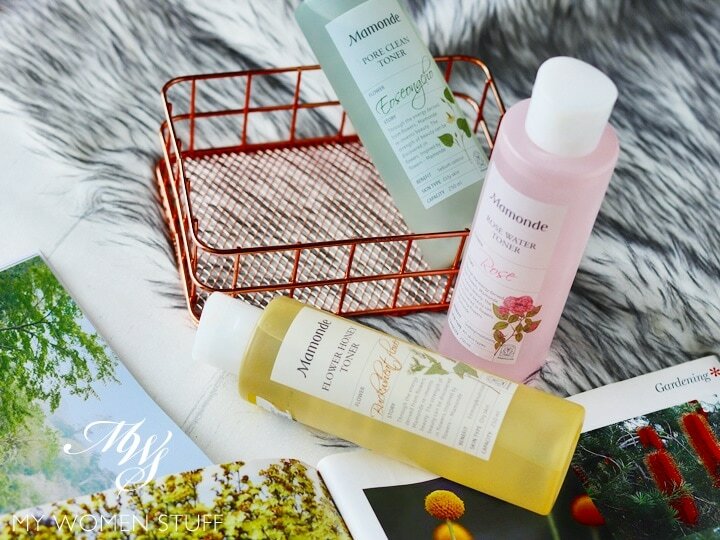 Which Mamonde Flower Toner to pick? I think it’s interesting that Mamonde has expanded their toner range. During the media event, they also introduced the concept of “multi-toning” which is like multi-masking – you use a different toner on a different part of your face, depending on your skin’s needs. Personally, I feel it’s just too much. Masks are generally left on for a while on the face, and I can understand how multi-masking is beneficial. But toners are usually very liquid and wipe on, or patted on only. It is far too much work to use a different toner for a different part of your face. This is what I railed on a little, about brands not making their products easier for us to understand. Skincare isn’t complicated. Don’t complicate things! Personally, despite the fact I enjoy using the Mamonde Flower Honey Toner, I will recommend only the Rose Water Toner for all skin types. For dry skin types, you will get more hydration benefits from layering it – you don’t need to go at your skin with a sledgehammer. 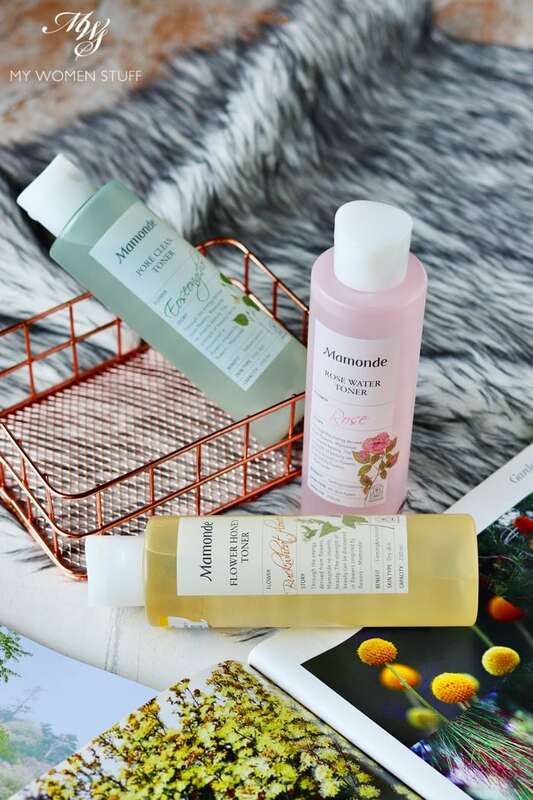 The reason I pick the Mamonde Rose Water Toner is because aside from the fragrance, it contains primarily rose water, not mere water as is found in the other toners. The reason I did not pick the Flower Honey Toner is due to the presence of Alcohol and a low presence of honey. I do think Mamonde could have (and perhaps, should have) capitalized on the popularity of their Rose Water Toner, and used it as a base for their other toners. If you have sensitive skin, then do consider the fragrance-free Chamomile Pure Toner. And if you have oily skin, perhaps the Pore Clean Toner. 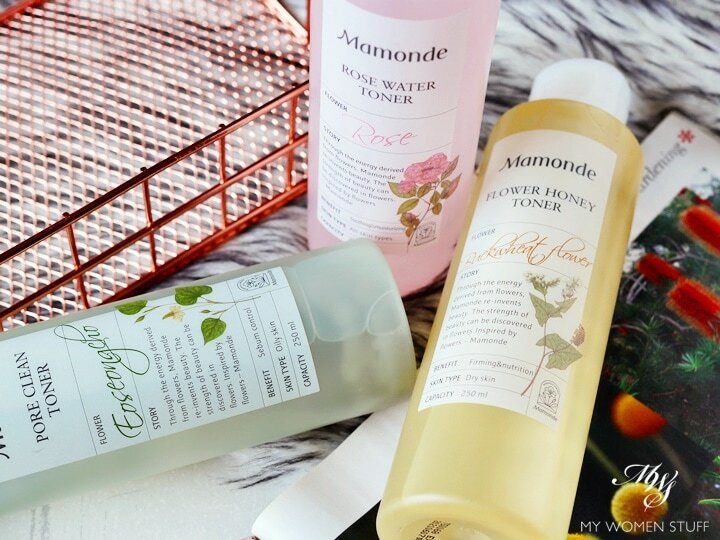 Have you used the Mamonde Rose Water Toner before? Disclosure: Some items were gifts from a press event, one was purchased by me. Our commitment is to honesty and fairness. For review guidelines please read the disclaimer. How would you rate the Rose watwr compared to HADA LABO KIWAMIZU LOTION or THE HERB FARM REJUVENATING FACIAL TONING MIST ? Using the HLKL as mist now and quite like it for hydrating and affordable price. I think the Hada Labo Kiwamizu lotion is more hydrating. But my nose is sensitive to it (makes me sneeze) which is why I don’t use it after I finished my bottle. It is otherwise decent and affordable. Thanks for giving me the idea of filling a spritz bottle with a hydrating toner than buying a mist. Heh heh. Gonna try it out. By the way, the rose one sounds so good with your recommendation. Thanks for that. Participated in their toner exchange and got all their range to try in the form of 25 ml sample. The Mamonde Aqua Peel Toner is the best. Gentle peeling and not drying at all. I might consider purchasing it along with rose toner. Thanks for sharing Margaret! 🙂 Glad to know it’s gentle. Too many people want things that are so strong, and then wonder why their skin gets screwed up! Sometimes, higher percentages isn’t better.